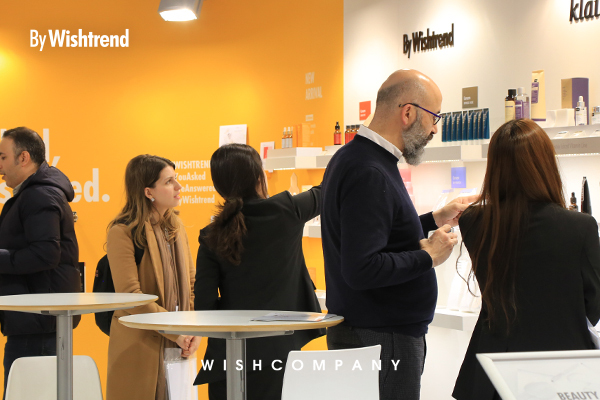 Wishcompany.net) has opened an exclusive booth at Cosmoprof Worldwide Bologna 2019, the world's leading beauty exhibition in Bologna, Italy. Wishcompany had introduced its skin care brands Klairs and By Wishtrend to the European buyers. Cosmoprof is one of the world's biggest international beauty exhibition, with major cosmetic companies, buyers, distributors, and media gather around the world. It is held every year in Bologna, Las Vegas, and Hong Kong. And at Cosmoprof Bologna where has a high level of participation from European countries, the brand's status in the European market can be measured in response to the visitors. This year, Cosmoprof Bologna has attracted more than 3,000 companies and 265,000 attendees from 70 countries. At Wishcompany's booth, more than 70 new buyers from the major distribution channels in Europe, including Sweden, Germany, UK, and Spain had discussed future business plans. Most of them already had the acknowledgment of Klairs and By Wishtrend which already have become Best Sellers in Europe. Klairs and By Wishtrend have been rapidly expanding in Europe, covering both online and offline channels. Klairs, a sensitive skincare brand, has launched in Selfridges in the UK and at Vitusapotek, the major drugstore in Norway. Klairs has ranked third on Sweden's Top Beauty Commerce and continues to build its reputation in Spain, Germany, and Denmark. By Wishtrend, a cosmeceutical brand that reflects product development based on directly listening to the skincare concerns left by the 500,000 worldwide customers of the global e-commerce Wishtrend(wishtrend.com), has gained credibility and awareness after Klairs. By Wishtrend Pure Vitamin C 21.5% Advanced Serum has been gaining popularity in Southeast Asia, and ranked fifth on Face Night Care category on the UK Amazon. Soungho Ryan Park, CEO of Wishcompany said "Klairs and By Wishtrend have now built massive brand fandom in Europe, beyond their expectations for K-Beauty, and the European buyers we've met at Cosmoprof Bologna 2019 aware of our brands' strengths. We will continue to expand distribution channels in the European market." Meanwhile, Wishcompany has successfully launched brands such as Klairs, By Wishtrend, and Jungle Botanics. In addition, Wishcompany plans and produces overseas beauty contents and have built media channels with a big fandom. The channel has more than 3.8 million subscribers and 100 million views, mainly on the representative channel 'Wishtrend TV'. This is a rare example of a Korean company building a massive global beauty content channel. With such strengths, Wishcompany has been reaching high sales both online and offline in over 70 countries around the world. Alongside direct sales through the online commerce site 'Wishtrend.com', online distribution and marketing partnerships with companies around the globe has allowed doubling the annual sales growth.